Window replacement – Budd Severino Advanced Home Exteriors, Inc.
At Budd Severino Advanced Home Exteriors, Inc., we make window replacement easy. All you have to do is choose between aluminum or vinyl frame windows, and let us do the rest. Our aluminum frame windows are manufactured to rigid standards using superior materials. 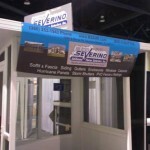 These windows are offered in three styles; single-hung, horizontal roller and awning type. Our vinyl windows are made with a special multi-chamber design. Besides the obvious benefits of corrosion free vinyl construction, the dead air space created by these carefully engineered chambers within our vinyl windows allow insulation values not found in wood, aluminum or other vinyl windows. All our windows are custom made to exactly fit each opening. Each is made to meet or exceed AAMA specifications for residential and commercial installations. We also offer a variety of frame colors; single glaze or insulated, clear or tinted glass. As if all of this is not enough, our installation is second to none.